While the rest of the country dreams of the excitement of New York City, we here in the Northeast can take a bite of the Big Apple most any day. For most of us, the City is but a train ride away, and no matter how often we visit, there is always something new. This summer, forget the high-end shopping and museums. Take the train into the City and brush up on some sailing skills. And when the boat is docked, venture out to one of the nearby parks or stroll the docks. Visit nycgovparks.com for a list of events. The subways are well marked if you want to travel with the locals, or you can always hail a cab and hold on to your seat. Check out these New York sailing schools and clubs and plan some exciting sail time in the Big Apple! Located downtown at North Cove Marina in Battery Park City is Manhattan Sailing School that offers Summer Sailing Camp to juniors (age 8 – 13) and teens (13 – 18) as well as basic and advanced instruction for adults. Adult classes offer a variety of options including weekdays, evenings and weekend instruction. Adult instruction includes everything from Basic and Level Two Learn to Sail programs to advanced instruction in Coastal Cruising, Bareboat Charter, Racing and Coastal Navigation. The staff of experienced instructors is second to none: instructors range from those who grew up on Long Island Sound to California and boasts an international cast of instructors as well. In addition to sailing courses, the Manhattan Sailing School offers exciting corporate programs and welcomes company teams to participate in the Thursday night Corporate Racing Series. Other corporate opportunities include team-building events Graduates of Manhattan Sailing School programs are eligible to join the Manhattan Sailing Club, which boasts a fleet of 30 club-owned J/24s which are docked at Dennis Conner’s North Cove Marina, in front of the World Financial Center. The majestic 150-foot three-masted schooner Arabella resides in North Cove and serves as the clubhouse. During the winter, Arabella cruises the Caribbean. Among the many benefits of club membership is the Mentor Program, which prepares less experienced sailors to be club-certified skippers. Membership in the sailing club also offers options to join the annual “De Caribbean Regatta,” a full week of sailing and socializing each winter in the Caribbean. Visit sailmanhattan.com for full course schedules and more information, or call 212-786-0400. For Manhattan Sailing Club membership information, visit myc.org. Founded in 1964 by Olympian and America’s Cup sailor Steve Colgate, Offshore Sailing School is now in its 49th year with eight locations in the U.S. and Caribbean. Three are located on the Hudson River: two in Manhattan and one in Liberty Landing Marina in Jersey City, NJ (home of the Offshore Sailing Club base). The Manhattan base is located at historic Chelsea Piers, which is a convenient walk from Penn Station. Offshore’s lower Manhattan location is at the recently renovated Pier 25 in Tribeca, part of Hudson River Park and a quick walk from the Lexington Avenue Subway that runs through Grand Central Terminal. All locations offer three-day Learn to Sail and Performance Sailing courses from April to October, as well as private lessons and two- hour Introductory Sailing clinics. 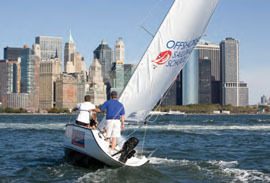 New this season is access to the New Jersey-based Offshore Sailing Club in Manhattan at Pier 25. Membership is open to school graduates, and members are eligible to skipper a boat upon completion of an Offshore class. Qualified sailors who are non-Offshore graduates can join after sailing with an Offshore instructor and exhibiting competent skills. The award-winning Colgate 26 is used for all Offshore instruction and club activities. The club provides unlimited sailing and special activities such as Full Moon Sails and Harbor Scavenger Hunts. Most popular is the club’s racing schedule, which includes new, low-key non-spinnaker races on Monday evenings. Sailing is the perfect platform to encourage good leadership and create teams out of divergent personalities. Offshore offers team building and group outings at all three of their New York City locations. Additionally, catered luncheons and award parties for team building and group sailing adventures can be arranged. For more information, call Sean Meszkat at 201-432-7763 or visit offshoresailing.com. Just a short walk from Chelsea Piers is Hudson River Community Sailing, which offers a strong youth program as well as adult classes and corporate team building opportunities. The Sail Academy, open to high school freshmen, is a complete one-year curriculum that consists of sail training in the fall, boat building in the winter and the math and science behind sailing in the spring. A summer sail program is offered for grades 6 through 11. Adult classes begin with an Intro to Sailing for those with no experience to U.S. Sailing certified Basic Keelboat. Students are offered further opportunity through open classes that help them strengthen skills. Coastal Cruising and Race classes are also available, as are private lessons. Want to learn to sail as a family? Hudson River Community Sailing also offers a program for the entire family to hop aboard and learn to sail together at an affordable rate. Need some corporate team building? Want to impress a client with a day of sailing the Hudson? Or maybe you would just like to get some friends together for an afternoon sail? Hudson River Community Sailing can accommodate your group with an outing tailored to fit your individual needs. Visit hudsonsailing.org to learn more about specific course schedules, summer youth programs and group events. Also, now is a great time to sign up for this year’s Caribbean Cruise! Another New York City-based organization – created for sailors with a need for speed – opened just as this issue went to press. Halcyon Sailing was co-founded by Simon Karstoft, a member of the Danish Olympic Sailing Team in the 49er from 2007 through 2010, and Craig Page, a lifelong New Yorker, former member of the Stanford University Varsity Sailing Team, and an experienced ocean racer. “Halcyon Sailing is a new high performance sailing option in New York,” said Page. “We have a fleet of three Farr 30s, and we do corporate team building as well as racing and teaching. Our sailing events expose corporate groups to fast-paced direct competition, racing our sailboats right off Manhattan. Our all-inclusive team building events require no travel and can be done in an afternoon. We have conference space on Greenwich Street in TriBeCa, two blocks from our boats, which are at Pier 25.” In addition to their Racing League for talented sailors, Halcyon Sailing offers Day and Sunset Cruises that are tailored to the client’s desire. With one of Halcyon’s expert skippers aboard, you can take an intensive racing lesson or enjoy a quiet evening with your family. For more information, call 212-300-4066 or visit halcyonsailing.com. Newport, Rhode Island In sharp contrast to New York City, historic Newport offers a much slower pace. There is, however, much to do in Newport – and it’s a great place to simply relax and soak up the rays. If you’re enrolling in a live-aboard course in Newport, you might want to come a day or two early – or stay a couple days when you get off the boat. Those who are off the water in the afternoon will have plenty to do without having to wander far from the docks. From upscale boutique shopping to eclectic dining or pub hopping, Newport’s nightlife offers a wide variety of music and entertainment. Located in the heart of downtown Newport, J World, The Performance Sailing School, is celebrating its 32nd year. Founded in 1982, J World is the oldest operating school in Newport and offers Learn to Sail, Intermediate Sailing, Bareboat Prep and Racing courses in both midweek and weekend formats from June through September. Custom courses and US Sailing certification are available. J World’s teaching format is simple: spend more time on the water (six hours each day), minimize classroom time (one hour per day), use great teaching boats (J Boats), and use full time professional instructors. “We emphasize time on the water, and believe the most effective and fun way to learn is with your hand on a tiller and the wind in your face,” said J World’s President, John Alofsin. “Whether you are a first-time sailor or an old salt, if you are attending because learning is most important to you, then J World is the place to be,” Alofsin continued. Training is accomplished in a focused, fun environment. This is a well-proven sailing course and their immersion system has proven extremely effective over the years. For course information, schedules and lodging information, call 800-343-2255 or visit jworldschool.com. 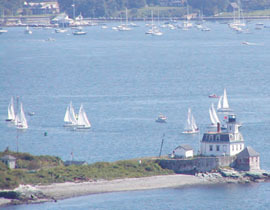 Just across the bay from Newport in Jamestown is the home of Blue Water Sailing School. Blue Water offers its monohull Bareboat Chartering Course at this location, which also serves as the destination port for one of their offshore passagemaking courses. This course combines the American Sailing Association Basic Sailing (ASA 101), Basic Coastal Cruising (ASA 103), and Bareboat Chartering (ASA 104) levels of the ASA curriculum. No prior experience or certification is necessary for this course. However, if you’re completely new to sailing it’s very important to study and prepare before the first day of class. Course materials are sent out in advance so that students are well prepared. Students will have a “hands on” experience in which they will actually go on a weeklong live-aboard cruise, mooring at a different location every night. Instructors are licensed by the U.S. Coast Guard and certified by the ASA after an exhaustive evaluation process. Blue Water offers “serious training for cruising sailors, and those who want to be.” For a full course catalog and class schedule, visit bwss.com.